Turquoise is one of the most prestigious stones used in lapidary. It’s been used for thousands of years, even as far back as the period of King Tut, as it is seen in his burial mask. 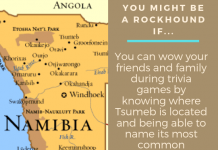 It can be found in almost all regions of the world from Turkey and China to North America. Colored by copper, the colors in turquoise range from blue to green. Turquoise has a hardness of 5 to 6 on the Mohs scale. The most sought out turquoise is usually the evenly balanced single colored stones or specimens with spider webbing and some matrix showing. Over the years turquoise has seemingly lost some of its value due to treatments and imitations that flood the market. However, there are many examples of it becoming extremely rare due to closures of mines or through the process of depletion. When purchasing turquoise, many times it is very hard to tell what you will get by purchasing rough material. 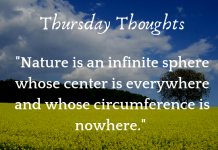 What you see on the outside can be entirely different from what you get once its cut and polished. 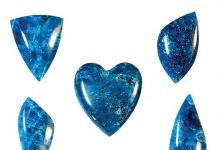 If you are new to cutting turquoise, it might be best to find cut slabs. This will allow you to see what the material will look like. Many times turquoise can be just on the surface and not run all the way through the stone. But by buying already cut material, you can alleviate buying something unusable or picking up something that has too much waste material. This is especially true since you are buying it by the pound. Another thing to always ask when purchasing is whether the material has been stabilized. 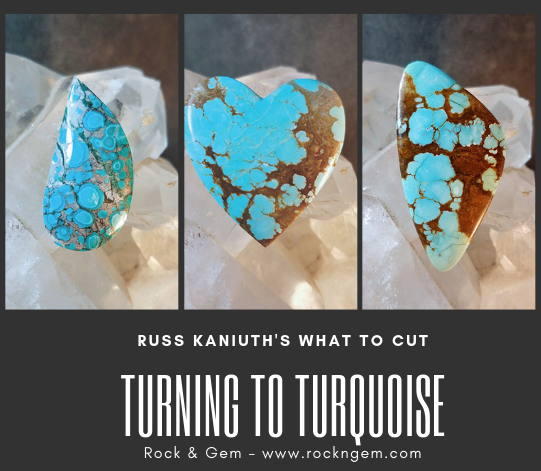 The majority of all turquoise nowadays has been stabilized, but if you find the natural material you will have to consider an entirely different perspective and greater patience when cutting and cabbing this material. Slabbing turquoise is usually best by hand cutting on a smaller saw using a very thin blade. Many will say using thin blades saves you from wasting too much of the material, and this is true. However, the benefit of using a thinner blade, in this case, is a less aggressive blade running through your sensitive material. This keeps the vibrations down the material doesn’t break apart during cutting. 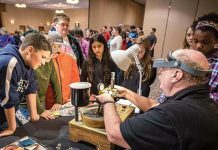 Over the years, I have discussed the cabbing process with many cabochon cutters, and there seem to be so many different ways to approach cabbing this material. For anyone cutting turquoise for the first time, let me just suggest, finding stabilized material for the first time to get a feel for how it cuts. I would always start on a less aggressive wheel, usually a 220 steel to shape your preform and start the doming process. After, I personally like using the 220 soft resin Nova wheel to gently smooth it out and remove material, but keep from creating flat spots. From this point take a gentle approach, and carefully watch how much material is being removed. Remember, this is a delicate and soft material that you can potentially grind thru in a hurry or crumble to pieces.Take the usual steps to finish your cab, by using a 600, 1200 and 14k grit wheel. The finishing process has a bunch of different options as well. I like to go up to a 50k grit nova wheel and possibly use a white jewelers rouge if needed. Some may use Zam polishing compounds, but it depends on the type of turquoise you are working with. 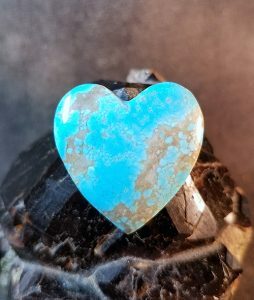 There’s a new Facebook group called Cabs and Slabs - The Turquoise Emporium, where you can always log in and see various types and designs of turquoise each day, and ask questions of fellow designers.